A Castañeda (2018): “Reporting on terror. Analysis of the use of infographics in news on the Barcelona terror attacks of 17 August, 2017, by print newspapers from the Basque Autonomous Community”. Revista Latina de Comunicación Social, 73, pp. 662 to 687. Introduction. This article evaluates the quality of the infographics published in the print general-information newspapers of the Autonomous Community of the Basque Country after the Barcelona terror attacks of 17 August 2017. Methods. The study is based on the analysis of all the infographic material used in the news on the Barcelona terror attacks published by Basque print newspapers. The quality of these infographics is measured with the method developed by Spanish scholar Valero Sancho, which provides quality indexes that are determined through a numerical formula. Results and conclusions. The results reveal that El País newspaper published the largest number of infographics, while El Mundo published the best-quality infographics. El Correo and Diario Vasco also obtained high rates of infographic production, followed by the newspapers published by Grupo de Noticias, whose infographic quality is at an incipient stage. Keywords: Infographics; Basque Country; newspapers; local press; terrorism. 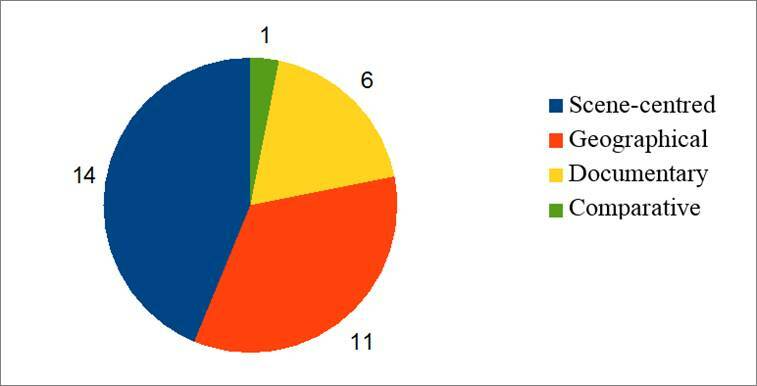 This article proposes an evaluative study of the use of infographics by general-information newspapers available in the Basque Country (Euskadi or Basque Autonomous Community), a Spanish region composed of three provinces, Biscay, Gipuzkoa and Alava, which have administrative autonomy, their own language, and the highest journalistic penetration in the country (Ymedia, 2017: p.6). The interest in reading newspapers in Euskadi, linked for decades to national territorial problems, as well as the important presence of journalistic institutions in Euskadi – since the 1970s, 2 of the 7 newspapers with the largest national circulation were established in Bilbao (El Correo Español - La Gaceta del Norte)-, have made this community a space of important interest for the analysis of the press. Moreover, infographics, the journalistic tool under study in this work, are equipped with powerful visual and informative elements, and have been painstakingly cultivated in the sample of news media under study in this article. This justifies their analysis based on a specific event that is described in the following lines: the 17-A. The 17-A, an acronym for “17 August”, which refers to the day on which Spain suffered one of the first jihadist fatal attack in its history, which was covered by all national and international newspapers. On that Thursday 17 of August 2017, a van driven by a 22-year-old man run over more than one hundred people in Las Ramblas in Barcelona, leaving 13 people dead and 130 injured (Benítez et. al., 2017). After crashing against a kiosk, the man took a car and wounded another pedestrian and a mosso d’esquadra -a member of the Catalan regional police-. The terrorist was intercepted and killed by the Catalan police four days later in the municipality of Subirats – Barcelona -, along with other 7 terror cell members that operated under the command of Abdelbaki Es Satty, an imam in Ripoll (Girona). Of the terrorist killed, 5 were killed by police on the seaside resort of Cambrils (Tarragona) two days before the death of Abouyaaqoub, while they were conducting another terrorist attack (Cadena SER, 2017). The remaining two suspects were shot a day before the 17-A in the small town of Alcanar in Catalonia’s Tarragona, while they were manipulating explosives that were going to be used to carry out a terrorist attack. These tragic events caused the dead of 16 people from 6 different nationalities - in addition to the terrorists killed by police - and more than one hundred wounded (El País, 2017). Given the relevance of this tragic event, the Spanish media constantly covered the 17-A throughout August, highlighting pieces of information about the attack as they were revealed. In the Basque Country, all print newspapers published very striking infographics. This article analyses the informative quality of all of these infographics published since the day of the attack, 17-A, until the end of the month. Infographics (or “information graphics”) can be defined in various ways depending on the discipline from which it is addressed. According to the RAE, its generic definition would be: “technique to generate images using a computer”. Limiting the definition to the journalistic field, the RAE specifies that infographics is a “graphic representation that supports a piece of journalistic information”, which provides a more precise idea for our study. There is no doubt that both definitions are a bit inadequate, given that according to the first definition, any image created through a computer would automatically be an infographic (Valero Sancho, 2001: p.25), which invalidate all infographics produced prior to the existence of computers. Thus, it is understood that “info” does not derive from “computer” but from “information”, -although informatics also derives from “automatic information” (De Pablos, 1998: para. 5)-, or from the English term “information graphics”, as mentioned. Accordingly, all information transmitted through the graphic language would be an infographic. For this reason, De Pablos considers that infographics have always existed . Thus, infographics can be defined as a diagram-based representation of data, being a diagram a “drawing that shows the relationships between different parts of a set or system” (Cairo, 2008: p.21). It combines text and image (De Pablos, 1998: para.1), and relies on symbolic and iconic, forms and may be also accompanied by text, and has the diagram as its core. If infographics are circulated in digital format, they can also contain audio elements (Valero Sancho, 2001: p.201). Due to its communicative utility to represent information, it is not strange that infographics have almost always been the object of study of journalism, where they has been developed with the greatest potential, sometimes constituting not only a complement to textual information, but the integral articulation of such information (Valero Sancho, 2001: p.57; 2009: p.52). Infographics, thus, can have such an informative potential that they can even replace the conventional newspaper article, although it should not compete with it given that journalistic infographics and text are interdependent (Leturia, 1998: para.4). However, in the increasingly visual context in which the reader is plunged, we should not forget that the audience, sometimes, only reads the infographics and other supplemental visual materials (Curtis, 1991). As mentioned, in the ranking of the 17 autonomous regions of Spain, Euskadi has the third highest newspaper penetration, with a rate of 38%, which is only surpassed by Madrid and Asturias, with 44%, and the Valencian Community, with 40% (Ymedia, 2017: p.6). Newspaper readership in Navarra and the Basque regions is measured by CIES, which has provided the following infographic. Euskadi has a total of 11 newspapers, of which 9 are general information and are included in the sample of this study: El Correo - since 1938 El Correo Español-El Pueblo Vasco(Vocento, 2017) -,Diario Vasco, Deia, Gara, El País, Berria, El Mundo del siglo XXI - or simply El Mundo -, Noticias de Gipuzkoa and Diario de Noticias de Álava. 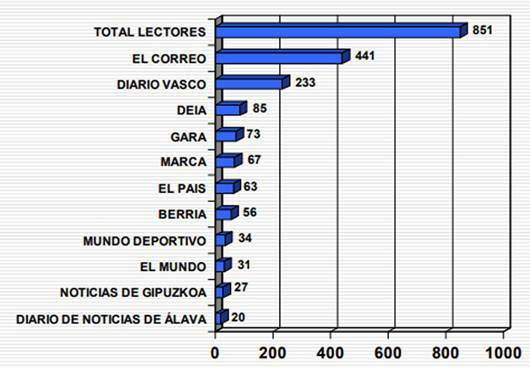 As we can see, the majority of these newspapers are provincial news media; El Correo and Deia are deans of Biscay: the first is the most-read newspaper also in Alava and the whole Basque Country. Although we have previously referred to it as national newspaper, since the Transition until today, El Correo has become specialised in Euskadi, extending its editorial group, Vocento, to the entire Spanish territory through other regional papers, of which ABC is the national newspaper with the greatest relevance. For its part, Grupo de Noticias, to which Deia belongs, competes against Vocento, in Alava with Diario de Noticias de Álava, and in Gipuzkoa with Noticias de Gipuzkoa. Berria and Gara could be define as newspapers “of national Basque scope”. The Basque nation or “Euskal Herria”, a name reclaimed by Basque nationalism since the Spanish Transition, constitutes the space of circulation of these newspapers, namely the Basque Country as a three-provincial regional unity, to which we must add Navarra and the French Basque Country . To do so, both newspapers have editions for each territory. Berria, edited in the Guipuzcoan town of Andoain by Euskal Editorea SM, has specific supplements named Hitza -which means “word” in Basque- for the provinces and regions of all its circulation space. In the case of Alava, the supplement is called Alea (“copy”), after merging the local edition of Berria with the weekly of Arabako Alea. It is important to note, however, that the newspaper does not define itself as nationalist, but rather aims to cover information spaces in the Basque language in all the territories where it is spoken, lacking an editorial line and open to all ideologies present in its dissemination space. The province where it is read the most is Gipuzkoa. On the other hand, Gara, published by EKHE SA in San Sebastián and is defined, like is successor, the old Egin, as a tool working for the good of the country (Coca and Martínez, 1993: pp.25-26). It produces content in Basque and Spanish. In addition to its presence in the Basque Country and Navarra, it also has a Basque-French edition named Mediabask . Finally, El País and El Mundo are national newspapers, leaders in Spain among general-information newspapers (AIMC, 2017). Their Basque editions, however, do not enjoy great penetration and extend across the entire territory of the Autonomous Community regardless of its provinces. The sample of newspapers can be divided into two clearly distinct groups: constitutionalists -those that support the Spanish principles of national unity and the Constitution of 1978- and Basque nationalists -those that consider the Basque people a nation with its own rights-. Thus, and contrary to trend of votes, the most read newspapers of the Community are those published by Vocento: El Correo and Diario Vasco, which are constitutionalists, like El País, of Prisa, and El Mundo, of Unidad Editorial. According to their style books, Vocento’s manual establishes that the group “is committed explicitly to the democratic legality that under the protection of the Crown define the Constitution of 1978, as well as the laws that develop it and the statutes of autonomy” (De Sousa, 2003: p.19). For its part, El País defines itself statutorily as “an independent, national newspaper, with a general information scope, with a clear Europeanist commitment [...] and committed to safeguarding the social and democratic order established by the Constitution” (El País, 2002, p.21). Meanwhile, El Mundo defines itself as a “progressive, committed to the current democratic system, civil liberties and human rights” (De la Serna, 1996, p.117). In turn, the nationalist newspapers would be all those published by Grupo de Noticias -Deia, Diario de Noticias de Álava and Noticias de Gipuzkoa-, which are very close to the moderate bases of the Basque Nationalist Party , and Gara, which is closer to the Abertzale left . As mentioned, and according to the content of its opinion articles and its circulation space, Berria could be included in the nationalist group, although it does not define itself as such. With regards to the particularity of the Basque Language or Euskera, all newspapers use it in certain sections to greater or lesser extent, with the exception of El País and El Mundo. The rest of newspapers use almost always the Spanish language, despite the Basque words used to name Deia (“call”) and Gara – (“we are”). Berria (“news”) is, as mentioned, the only one published entirely in Basque, being the main promoter of such language. In this regard, it is important to mention that nearly 40% of the population over two years of age of the Autonomous Community is currently bilingual -speaks Spanish and Basque-, which must be added to the 25% of the population are almost-Basque speakers (Eustat, 2011). According to the literature on Spanish infographics, Valero Sancho speaks of the praising of infographics by international journalistic sources such as Boksembaum, Withey and Gray, who praise their level of quality, despite the fact that up to the 1980s infographics were not employed in the country’s newspapers (Valero Sancho, 2001: p.62). According to this author, El Mundo was the first to use infographics at the end of the 1980s, although the genre reached our press assiduously through Catalonia, with such relevant exponents as El Periódico de Catalunya and La Vanguardia. However, we have to mention the graphic quality of El Mundo, which was awarded nine times by the Society for News Design, for its layout and infographics (Valero Sancho, 2001: p.69). It is also important to note the contribution of El País, which is a newspaper of infographic reference thanks to outstanding professionals such as Clapers, Ondarra and Tascón (Valero Sancho, 2001: p.68). Local academic studies have also praised the infographic production of El Correo. García-González, a researcher at the University of the Basque Country, analyses in his doctoral thesis (2012) such production from 1910 to 2012, from a historical perspective that covers methods, the working routines and conditions of producers of infographics in the newspaper, getting an image that highlights the excellence of the production of this newspaper. According to the cited sources, we can expect that the best-quality infographics will correspond to those published in El Mundo, El País and El Correo, and that the first one will stand out due to its historical journey and technological resources, despite being one of the least read newspapers in Euskadi. To justify a method to measure the quality of infographics, it is necessary to know how many of these exist today and assess their suitability. According to the available literature, the two best infographic quality measurement methods are the ones developed by Valero Sancho and Colle. Both methods are compared by Chimeno, who measures the effectiveness of infographics through questionnaires applied to focus groups (Chimeno, 2015: pp.47-48). The main difference between Valero Sancho and Colle is that while the latter establishes a pattern of critical analysis that evaluates a series of descriptive criteria between the different parts of an infographic -text, balance of forms, aesthetics, etc.-, the former assigns to each characteristic or property of infographics a numerical value -0 absence, 1 existence of the property-, collects all the obtained values and then calculates an index whose position on a scale will show the quality score of an infographic. Both methods can be applied to an infographic, taking into account that the first one is primarily qualitative while the second operates with numeric values and indexes. Both methods are also applicable to infographics in print and digital formats. The method used here is the one proposed by Valero Sancho, which assesses newspaper infographics based on the collection of zeros and ones that are obtained by adding these figures based on previously established characteristics. This method seems to be ideal to compare all the infographics under study in a systematic and orderly way and to extract very accurate values of the quality of infographics. It must be noted, however, that this method is especially designed for printed infographics and some of its sections need to be adapted to be able to apply it for digital infographics. Valero Sancho suggests that all infographics can be classified into a concrete type and performs his own classification while others such as Colle propose their own (Colle, 2004). For Valero Sancho, there are two clearly differentiated types of infographics: individual and collective. The first type refers to those that “have the essential characteristics of a single infographic, and of several infographics that are together, deal with a single subject and [...] do not include double titles or internal boxes” (Valero Sancho, 2001 p.132). Collective infographics are “several infographics that appear together” or “several individual infographics, either simple or complex, that display information with certain important applications” (Valero Sancho, 2001: p.149). Both types include sub-types, which in the case of the infographics found in this study are: among the individual ones, scene-centred, geographical, documentary and comparative; among the collective ones, geographical and documentary. In the case of individual and collective infographics, the geographical types aim to place facts in a specific space, using maps, plans and purpose-created spaces to orient the reader (Valero Sancho, 2001: p.147). In the case of collective infographics, some geographical infographics may also be called documentary, given that such plans or maps can include documentary informative extensions (Valero Sancho, 2001: p.152). In the case of individual infographics -which is basically all of the infographics included in the sample-, the documentary type aims to explain with details the features of events, actions or things, which tend to be relevant to understand the information (Valero Sancho, 2001: p.139), especially if it is of a technical nature or requires additional extensions - for example, the case of the functioning of machines, the human body or some detailed event encompassing several details-. They have nothing to do with the scene-centred type, although they also aim to document in the most informative sense of the word, they are most commonly used to describe the scene of attacks or complex multi-part events that require scene-by-scene explanations - sometimes similarly to a comic- as if the events had been witnessed by a viewer. The hypothesis is that in the present case, most of the studied infographics will fall in this category. Finally, the individual comparative infographics are those that aim to “compare several elements or any of their parts through graphic resources, in a way that provides quick visual information of the elements or variables under study” (Valero Sancho, 2001: p.134). -Information (INF ). Is the main objective of infographics, as journalistic content that must structure and organise data and ideas, according to a hierarchy of relevance and responding, as any newspaper article, to the well-known 4W: What/Who? When? Where? and Why? It can be said that an infographic is informative when it responds adequately to the 4W. -Significance (SIG). An infographic will be significant if its information - structured organisation of data and ideas - is relevant, useful and current to the reader. Thus, significance is completed according to the following properties (Valero Sancho, 2001: p.153): clarity of the key issue, making clear what the event shown and described is all about; familiarity of the event with the reading public; identification of the elements, characters and actions that are reported; novelty of the reported events, given that the press basically exists to inform about recent developments. -Understanding (UND). Is the feature that gives the infographics an organisation in its elements and makes it intelligible to the reader’s eyes, because if the elements of the infographic are ambiguous it will be rendered invisible (Valero Sancho, 2001: p.161). Understanding is assessed by taking into account visibility, the proper complementation and structuring of texts and images; readability, which is the absence of spelling mistakes and the use of correct language; clarity, i.e., clear and understandable symbols and texts; and didacticism , the data presented should also be easy to memorise and enable the understanding of the narrative. -Aesthetics (AES). It the feature that covers the infographics with elements that are artistic or provide beauty or grace to the sight. While the absence of aesthetic elements does not diminish the quality of infographics, whose main objective is to inform (Valero Sancho, 2001: p.165), their presence does provide quality. The properties that provide certain aesthetic to the infographic product include the increasingly less frequent retouch-ups by hand, graphic details to polish the finishing touches and shadows, and dynamism and originality of the arrangement of elements. -Iconicity (ICO). Includes the degree of contribution of figurative unencrypted messages, which use signs to represent objects and realities and make them recognisable to the reader (Valero Sancho, 2001: p.169). Thus, an infographic is more iconic the bigger its use of photos and drawings that come as close as possible to our perception of reality. Thus, iconicity increases with photographs and 3D figures, and decreases with abstract and flat figures, although one has to observe how these elements are arranged in each case. -Typography (TYP). Refers to the texts on which the infographics relies to inform, given that infographics are not conceived without written information (Valero Sancho, 2001: p.173). Thus, it is important to understand that an infographic should have a title that identifies it, as well as the signature of its author, which can give prestige to the work. The infographics should also have explanatory texts - not longer than 27 words - and labels that, in the form of small titles, identify the most important aspects of the infographics. -Functionality (FUN). Refers to the functionality of the infographics as written press text, given that an infographic will be more functional the more understood it is by itself, providing information not contained in the written article - complement - and even replacing the written information with a large infographics or mega-infographics (Valero Sancho, 2001, p.177). In case the infographics summarises the information of the news article, we talk about the capacity of synthesis. All of the above features must exist under the prism of concordance, i.e., that property that obeys the rules and minimum elements for the social use of infographics (Valero Sancho, 2001: p.179). Thus, if an infographic provides unreal information or lacks facts there is a lack of concordance. The same thing happens with orthography, since we cannot tolerate errors in the use of the written language. Taking into account all the parameters stated above around infographics, Valero Sancho proposes the coding of each of these features through a binary system of zeros and ones. Thus, for an infographic to obtain an X level of significance (SIG), it should add 0 or 1 to the clarity section (0, if there is no clarity; 1, if there is enough clarity); 0 or 1 to the sections measuring familiarity, identification and novelty. Finally, the X value will result from the sum of the zeros and ones derived from each of the properties encompassed in the feature of significance, and so on with all the other features described above. The analyst must rate, based on their criteria as precise as possible, what number corresponds to each property, and whenever the analyst has doubts about whether an infographic is, for example, “clear” (SIG) or not he should evaluate it with 0 instead of 1. We have to keep in mind that while functionality (FUN) is measured with the binary code based on the variables synthesis and complement, other variables included in the formula: the proportion on the page -proportion of space occupied by the infographic in the newspaper sheet- and the proportion of the information, i.e., the amount of new information that the infographic provides with respect to the written text, which can be a complement or something new. In both cases, the value obtained derives from a 0-1 scale. In the case of mega infographics, or those infographics that occupy the entire page to narrate an event, the functionality value will always be 4, the maximum value (Valero Sancho, 2001: p.185). As we can see, by multiply by 100 and dividing by 28 we can obtain a centesimal value from the 28 possible values that can give the result (7 features for 4 properties each). The result will provide the value of the infographics on a scale that will allow us to assess it as: unacceptable, when the obtained value is lower than 40; regular, when the value is between 40 and 49’9; enough, when the value is between 50 and 59’9; remarkable, when the value is between 60 and 69’9; and excellent, when the value is 70 or more. That all the studied infographics are classifiable in their respective types. That all the infographics should have concordance. Each miss spelling subtracts 12.5 points from the total. That collective infographics are deducted 10 points with respect to the total, since they combine independent infographics that have their own value. That no feature can have a value of 0 except the aesthetic one . We selected all those infographics that dealt with the 17-A and were published by the printed editions of the sample of newspapers from the same day, 17 August 2017, to the 31st of the same month. The sample was composed by a total of 36 infographics, which is an important amount for the little more than two weeks of journalistic production under study. We examined all the infographics whose titles specified that they provided information about the attack. The sample was obtained from the newspaper library of the Leioa-Erandio Campus of the University of the Basque Country, to which the author belongs. A camera was used for information extraction and a Microsoft Excel file was used as a database, which included the title of each infographic, collection date and page. Subsequently, we created Excel tabs for each newspaper, to create the technical sheet of each infographic and calculate their value, according to the selected formula. Of the 36 infographics, only 4 have were collective, and the rest were individual and of all the aforementioned types. The most frequent infographic was the scene-centred individual type, which is used to represent attacks or events of great narrative complexity. -1 documentary collective infographic in El Mundo - day 18, p.9. * “Attack in Barcelona”, in Gara, day 18, front page. As the method specifies, 10 points were deducted from all of the above infographics for being collective, being El Mundo the most affected in this aspect. On the other hand, considering the amount of infographics obtained from each newspaper, it is striking that nearly a third were extracted from El País, followed in second place by El Mundo and El Correo with 5 infographics each. In this case, we can see the important work of the Prisa newspaper in the area of infographics, which greatly surpasses the rest, despite the newspapers of Unidad Editorial and Vocento also contribute a considerable amount to the total. 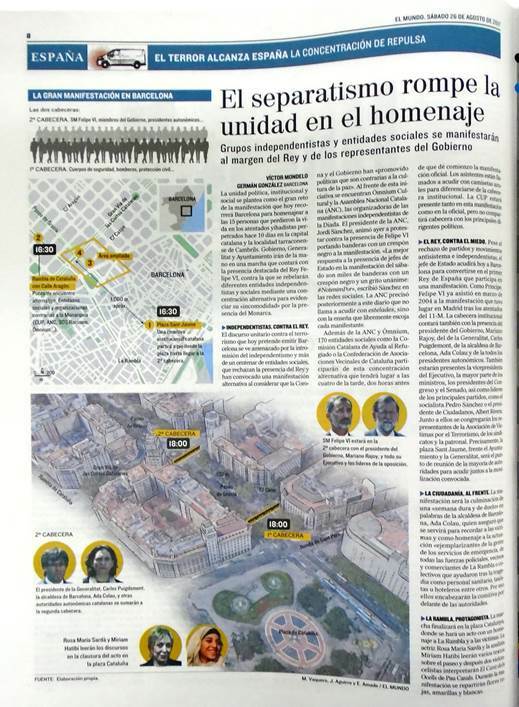 Although the figure does not show it, the infographics of El Correo and Diario Vasco are the same, except the one published on 18 August in the Basque newspaper, “Attack on Las Ramblas”, a scene-centred individual infographic of high quality made by JM (Josemi) Benítez and Izania Ollo, with an index of 75. Moreover, the infographics of Deia and Diario de Noticias de Álava are the same in all cases, despite being published in different pages. We must remember that in these cases, the newspapers belong to the same companies, and share the same materials. In this sense, Noticias de Gipuzkoa is an exception, since it only publishes one infographic, which has significant quality – an index of 60’36 -, that is not found in its sibling newspapers. Focusing on the quality of infographics, and considering the indexes, the following figure presents the arithmetic mean of all indexes by newspapers. While in terms of quantity El País stood out, with regards to quality, El Mundo obtained the best results, relegating Prisa’s newspaper to the 6th place. The newspapers of Vocento also publish excellent infographics, reaching nearly the average index of the newspaper of Unidad Editorial, the one praised the most for its graphic quality. With this data in hand, the following sections break down the distinctive features proposed in the method. In the case of information, El Mundo and the newspapers of Grupo de Noticias obtained in all their infographics a value of 4, as all of them answered to the 4Ws correctly. However, El País also obtained the highest score in all of its infographics except for one, published on 20 August, which obtained 0 in the item Why? and only obtained 3. Such infographic is geographical and shows the town of Ripoll within its region, in Catalonia, and therefore does not have to explain the “how” of a particular event. Something similar happens with El Correo and Diario Vasco, which on 23 August published a map of Spain –pages 25 and 28, respectively– which indicates with numbers the exact amounts of Islamic centres of worship in the country by regions, which goes beyond the subject which concerns us here but accompanies a report linked to the 17-A, where Vocento interviews the President of the Spanish Federation of Islamic Religious Entities on the violent discourse of some imams. In this geographical infographic is not necessary to explain the when and how of an event, and so it obtained a score of 2 in this case. Of the three infographics published by Gara, only one obtained the highest value in this feature, a world map published on 28 August (page 4), which shows the number of jihadist attacks around the world, which neither requires explaining the “how” of an event, and therefore obtains a score of 3. Berria, for its part, published on its front page on 18 August, a map of Barcelona showing the journey of the van and the different events that took place, without mentioning on-site when they occurred, which is surprising given that it is an infographic that accompanies the text. Source: Berria, 18 August, front page. All the studied infographics obtained the maximum value of significance, except for the one published on 28 August in Gara –Photograph 3–, which obtained a score of 0 in familiarity since the subject of the infographic is not familiar to the average reader of the Basque Country, which is not the target of jihadist attacks. However, it can be concluded that all the studied infographics are very significant for the audience. El País obtained the highest score in all its infographics in this feature. The only infographic published by Berria also obtained a score of 4. In the case of El Mundo, 3 out of its 5 infographics did not achieve the maximum score due to their lack of simplicity and clarity. In the case of the collective and geographical infographic published on Tuesday 22 (p.9), which describes the flight of Abouyaaqoub, it presents many image and text elements in such a way that the information is not perceived clearly, and it is necessary to examine many elements unified by the title. The infographic published on Friday 18 (p.9) and Thursday 26 (p.8) lack dynamism, as they are excessively complex and concentrate many elements which makes it difficult to discern the exposed information and memorise data more or less easily. Source: M Vaquero, J Aguirre, E Amade. El Mundo, 26 August, front page. 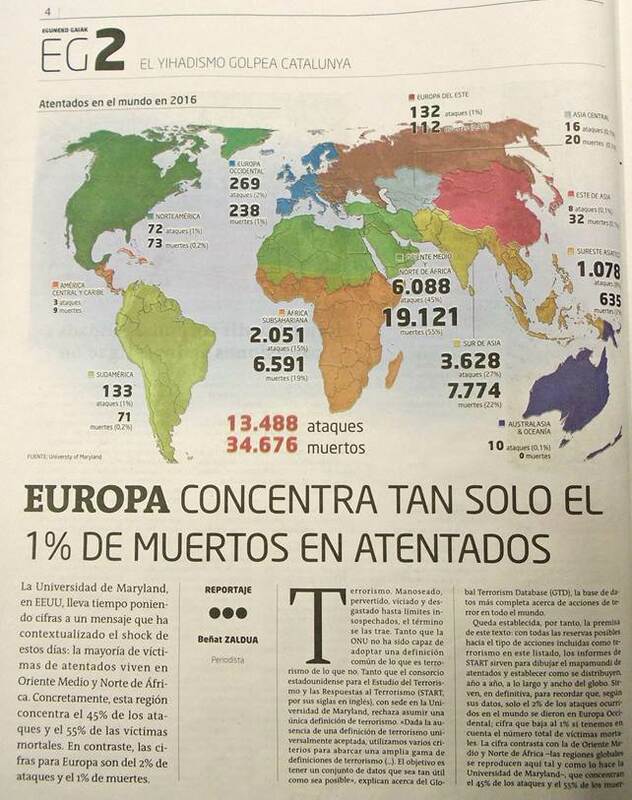 Similar to the case of El Mundo, an infographic of El Correo lacks some aspects that hinder its clarity. This infographic, created by Benítez and Ollo –Photograph 1–, it is legible and didactic, since the plurality of text and image elements are presented in an orderly manner that allow reading, by following the route of the central arrow, all the information about the event and retain the information from the top down. However, that plurality of elements –including photos– is what groups together all of these elements in a somewhat confusing way to the sight, and at the same time require an effort to highlight the texts from the graphic base, which decreases visibility, clarity and simplicity. Source: Gara, 18 August, p.2. On 24 August, El Correo and Diario Vasco, both edited by Vocento, published (in pages 24 and 25, respectively) a mega-infographic created by Benítez, which shows a map of the Mediterranean coast of Catalonia –including the metropolitan area of Barcelona and Tarragona–, which places and enumerates the different events, accompanied by new information provided by the security services, as well as a diagram showing the relationships of the 12 people involved in the attack. The tangled web of data stacked in the reduced space of the map complicates not so much its reading, but its clarity and its didactics. With regards to the 3 infographics published in Gara, 2 of them are far away from the maximum score due to their lack of clarity; the one from Friday 18 –Photograph 6– is geographical and collective and provides enough data and a significant amount of text boxes. 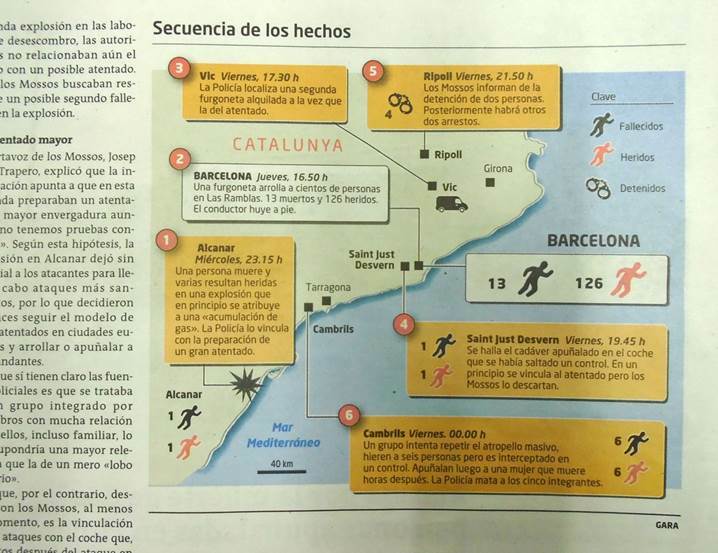 It could be said that in its majority it is almost a “textual” infographic, which also happens with the one published on 19 August –Photograph 7–, which shows a map of Catalonia that pin-points the different events that took place on the day of the attack, also with heavy text boxers and a composition with symbols and other graphic elements that “dance” over the image. This section ends with two infographics published by newspapers edited by Grupo de Noticias, starting with the only one of Noticias de Gipuzkoa –Photograph 2– which obtained the lowest score in understanding, with only one point on readability. Its complex composition, with countless elements in black and white complicate its visuality, annul its didacticism and simplicity. 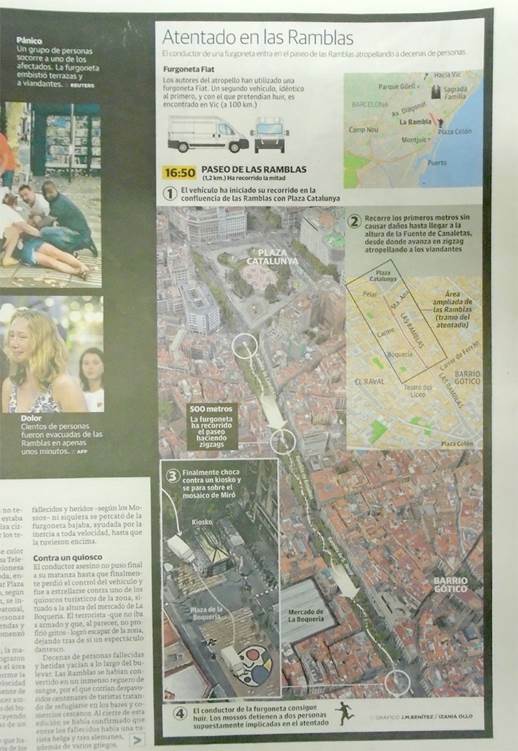 In the case of Deia and Diario de Noticias de Álava, both published a mega infographic on 22 August (pages 38-39 and 18-19, respectively), which describes the escape route of Abouyaaqoub on a map of Barcelona. It provides much information, with short and well-designed text boxes, even though they are mounted on the map in a bit messy way, which is worsened by the lack of colour and the low contrast between elements, which take two points away from its score in readability and clarity. The selected method overlooks some aspects of modern infographics, which are almost exclusively generated by a computer. Thus, none of the studied infographics has hand-made retouching, nor meets the highest score, ranging between 0 and 2. However, we can highlight some remarkably bright infographics, namely the one published on 18 August in El País (p.15), the mega infographic of 19 August in El Mundo (pp.8-9), and the infographic of 22 August in the same newspaper (p.9); the one published on 14 August in Deia (p.36) and Diario de Noticias de Álava (p.22), all of which obtained a score of 3, obtaining 1 in all properties except for “hand-made retouching”. Based on an arithmetic mean of the scores obtained in the area of iconicity by all newspapers, we can conclude that those with the highest quality index –Figure 4– also have the highest iconicity, primarily because they include photographs and 3D figures in their infographics. The newspapers that obtained a score of 4 are: El Mundo: day 19, pp.8-9 and day 26 (p.8, photograph 5); El País: day 19, p.19; El Correo: day 19, pp.22-23 and day 22, pp.20-21; and Diario Vasco: day 19, pp.26-27- and day 22, pp.24-25. As reflected by the pagination, many of them are mega infographics, which encompass a large number of elements that increase their iconic score 4. Given that all infographics must have a title that identifies them, as well as signs and explanatory texts accompanying the image, almost all of the studied cases meet the maximum score in typography, with the exception of the credits, because newspapers from the Grupo de Noticias, Gara and Berria, do not mention the author(s) of the infographics. However, the newspapers of Vocento do mention their remarkable authors, such as Benítez, Izania Ollo and Isabel Toledo. For its part, El Mundo has infographics artists such as J Aguirre, E Amadé, A Hernández, A Barrado, N Sánchez and M Vaquero. El País also displays the names of the authors, with such outstanding artists as Yolanda Clemente, Nacho Catalán, Carmen Ayuso and Rodrigo Silva. In this case, the proportions -of page and information- vary according to the size and contents of the infographics. On the other hand, and generally, the studied infographics synthesise rather than complement the information they accompany, i.e. they do not tend to provide new data to the texts but reinforce them. In El Mundo, the ones published on the days 18 (p.9), 19 (pp.8-9), 24 (pp.10-11) and 26 (p.8, Photograph 5). In El Correo, the ones published on the days 18 (p.19, Photograph 1), 19 (pp.22-23), 22 (pp.20-21) and 24 (p.24). In Diario Vasco, the ones published on the days 19 (pp.26-27), 22 (pp.24-25) and 24 (p.25). In El País, the ones published on the days 18 (p.15), 19 (p.19) and 22 (pp.16-17). In Gara, the one published on the day 28 (p.1, Photograph 3). According to the list, it is striking that nearly 42% of the infographics of the studied universe are mega infographics –15 of 36–, making clear the bet of the sample of newspapers on the functionality of these tools. Very remarkable is the case of the newspapers of Unidad Editorial and Vocento, which published a modest number of infographics –5 for El Mundo, 5 for El Correo and 4 for Diario Vasco– but top the ranking in number of mega infographics and in proportion with respect to their total. While all infographics had to be evaluated in the area of concordance, some of them have errors that are generally relating to the use of the language, that is, they present some confusion when it comes to name streets, squares and avenues of the city of Barcelona, whose official names are in Catalan. It is clear that aside from the linguistic policy of each newspaper, in which for example the newspapers of Grupo de Noticias name the affected region “Catalunya” instead of “Cataluña” out of nationalist solidarity, using the Catalan denomination, the infographics should show idiomatic consistency, or concordance, by writing the names of the affected places in Spanish or Catalan according to the book of style of each newspaper. Thus, there are surprisingly striking cases such as the unique infographic published by Berria –Photograph 4– whose errors of concordance –among others– make it unacceptable. 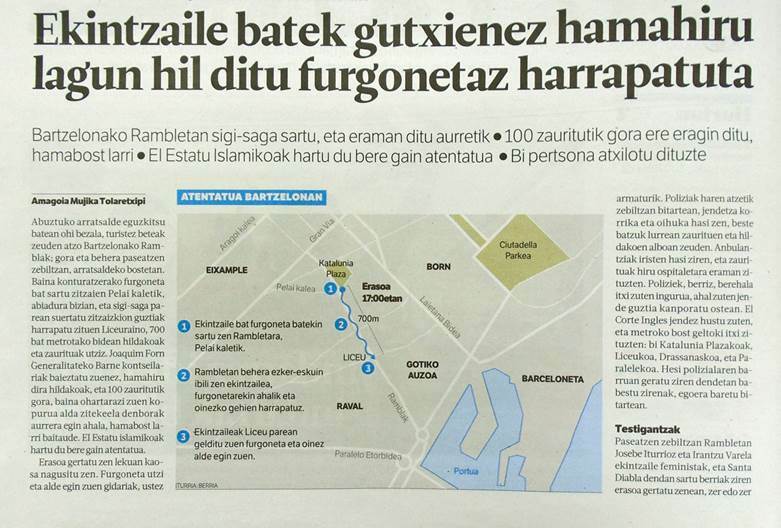 In its book of style, the Basque newspaper specifies that it will use the original language when naming the most emblematic or symbolic streets, buildings and places, and will translate to Euskera the names of generic places (Berria, n.d.: Hiri eta herrietako toponimia). However, in its infographic, this newspaper mixes the Catalan and Basque languages without any criteria when naming streets. A clear example is the case of Barcelona’s Pelayo street –Catalan: Carrer de Pelai–, which is translated as Pelai kalea, when the name in Basque would be Pelaio kalea. However, Aragón street –Carrer d'Aragó– is translated to the Basque language literally as –Aragoi kalea–. The infographic keeps original names such as Born, Barceloneta and Gran Vía, but translates the name of the Gothic Quarter –Gotiko Auzoa–. This tangle of terms reduces its clarity in 20 points. 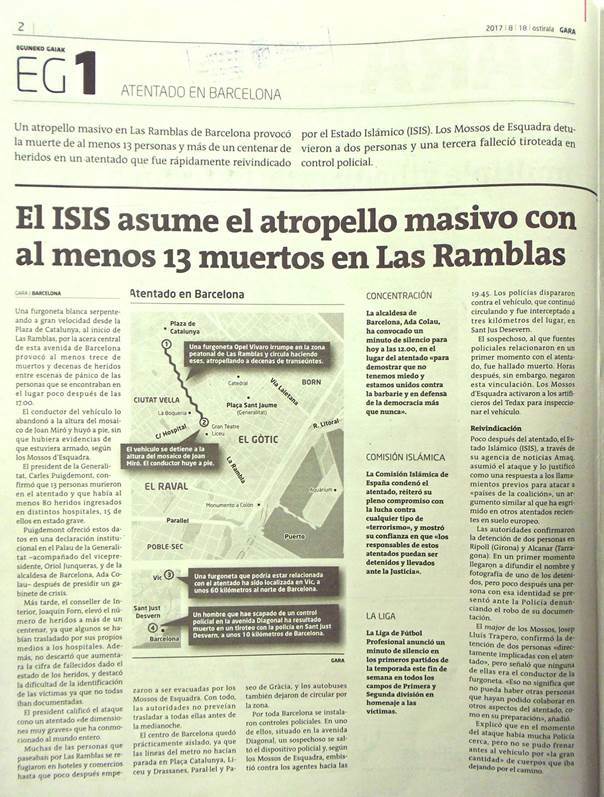 The same happens with the infographic published on 26 August in El País, “Demonstration in Barcelona against terrorism” (p.14), which from the beginning seems to prefer the Spanish names, by calling the city council of the capital Ayuntamiento de Barcelona, instead of Ajuntament de Barcelona, which is its official name . However, the newspaper names the Catalan government Generalitat de Cataluña, which mixes two separate terms in Catalan and Spanish –Generalidad de Cataluña and Generalitat de Catalunya–, which produces some confusion. The mixing of two languages also occurs when naming Catalonia Square, which is named Plaza de Catalunya instead of using the language of Cervantes, or simply using the Catalan denomination: Plaça de Catalunya. Amusingly, the newspaper keeps the names of the rest of the streets in the native language, except for the streets of Aragon and Majorca, without any apparent criterion that justifies it. These errors and another more serious error are present in the infographic of the day 18 in Gara – Photograph 6 -, which maintains the street names in the language of Lully, but names Catalonia Square as Plaza de Catalunya, in contrast with Saint James’s Square, which is labelled Plaça de Sant Jaume. However, apart from spelling errors, it is striking how Gara identifies the van of the attacker, pointing out that it is an Opel Vivaro, when the rest of the newspapers published it was a Fiat Talento. This fact does not blur the essence of the event but distorts or ignores a fact that may be relevant to the case. According to the results presented above, it is important to highlight the confirmation of the hypothesis that proposed that El Mundo newspaper publishes the best-quality infographics. However, surprisingly El País is not the newspaper that accompanies it in the level of quality, but El Correo and Diario Vasco, which are owned by Vocento and had also been praised in previous research for the quality of their infographics. However, it is worth highlighting that Prisa’s newspaper published the largest number of infographics during the period under study, becoming the first newspaper in trusting this informative material in the exercise of journalism and a reference in this field at the Spanish and Basque levels. Also worth mentioning is the infographic production of the newspapers of Grupo de Noticias –Deia, Diario de Noticias de Álava and Noticias de Gipuzkoa–, which do not produced a remarkable number of infographics in the period of analysis but obtained outstanding results in quality, which suggests that these newspapers increasingly trust the virtues of the infographic as an information format. In contrast, the infographic production of Gara and Berria obtained the worse results both in terms of quantity and quality, perhaps linked to the reduced availability of resources due to their smaller audience and relevance of their media companies. In terms of information, all of the studied infographics scored, with few exceptions, the maximum value, so it can be affirmed that all of them add to their final quality index a high informative level. In terms of significance, all of the studied infographics achieve the maximum value, except for Gara, and are mostly current and useful for their readers. In terms of understanding, it can be said that the studied infographics are very comprehensible, particularly the ones published by El País and the only one published by Berria, while the rest have one or more infographics that do not reach the maximum score mostly due to a lack of clarity. In terms of aesthetics, most of the studied infographics obtained very low scores, which suggests greater interest for other infographic features than for this aspect. In terms of iconicity, El Mundo, El Correo and Diario Vasco obtained the highest scores, especially due to their use of pictures and 3D figures, derived from a high level of detail, which is characteristic of a professional development. In terms of typography, all of the studied infographics obtained high scores, although only the newspapers owned by Vocento and El Mundo and El País tend to mention the authors of their infographics, which in the first case usually is Benítez, Ollo and Toledo; in the second, Aguirre, Amade, Hernández, Barrado, Sánchez and Vaquero; and in the third, Clemente, Catalán, Ayuso and Silva. In terms of functionality, each infographic obtained different scores based on its features. However, it is important to note the mega infographics which always scored 4 points in El Mundo (4 out of 5 mega infographics), El Correo (4/5), Diario Vasco (3/4), El País (2/11) and Gara (1/3). Almost 42% of the studied infographics are mega infographics, which makes clear the general bet of the sample of newspapers on the functionality of these tools, especially in the case of the newspapers of Unidad Editorial and Vocento regarding their total amounts. As a final touch, it can be argued that Basque newspapers produced quality infographics about the tragic event of great international interest and made frequent use of the infographic as informative material, highlighting its value and even more the journalistic and academic interest in future research in this field. “Today the limit of the Basque country extends across the Spanish and French border […]. The Basque linguistic space in northern Spain extends across four provinces: Bizkaia (Vizcaya), Araba (Alava), Gipuzkoa (Guipúzcoa), and Nafarroa (Navarra). The Basque region of France incluyes the ancient provinces of Labourd (Lapurdi), Basse-Navarre (Nafarroa Beherea), and Soule (Zuberoa) […]. The seven historic Basque provinces symbolize one of the historic slogans of the Basque movement: Zazpiak bat (The seve are one, that is four Spanish Basque provinces plus three French Basque provinces equals one […] Basque nation)”. Jacob, 1994: p. XV). In its first issue of 2 January 1999 (p.2), Gara stated: “the assertion that Gara has been conceived as a newspaper of Euskal Herria (...) is not an advertising slogan (...). It is the basis upon which each page of this newspaper will be built every day (...). This Basque national vision will also permeate the rest of the sections”. The abbreviations that are used to synthesise the names of the features are the author’s own contribution. In this regard, the author expands the details about the educational possibilities of infographics in the lecture delivered in the V. Latina Conference of Social Communication (Castañeda Zumeta, 2013). In this sense, one might think that any infographic that scores 0 in a characteristic not concerning aesthetics would be ruled out of this study, but this did not occur in any of the cases, although one infographic was discarded because it did not have a title, which is essential to consider its content as part of a single properly analysed unit - front page of 18 August in El País -. Chimeno, M. (2015). La eficacia comunicativa de la infografía como mensaje periodístico. Tesis doctoral. Valladolid (España): Universidad de Valladolid. Curtis, R. (1991). “Graphic design and typography for journalistic grades”. Conferencia. San Petersburgo (Florida): Poynter Institute for Media Studies, 23 July. Article received on 2 January 2017. Accepted on 18 March.